Here's a place that will be remembered for all the right reasons with some amazing views out to sea with it's beachfront location and spacious grounds with enough pools to swim like a champion. Located within the Southern part of Rhodes there's a true Greek environment. The activity program is packed full of adventure with some experiences to build a top photo album and the restaurants cook up some tasty meals for everyone to enjoy. The feeling is fresh with white washed walls and a cooling hint of sky blue. Rooms sleep for 1 and a terrace or balcony. There's a mini fridge stocked with refreshments on your arrival and replenished with water every two days and other essentials like LCD TV and air conditioning. The feeling is fresh with white washed walls and a cooling hint of sky blue. 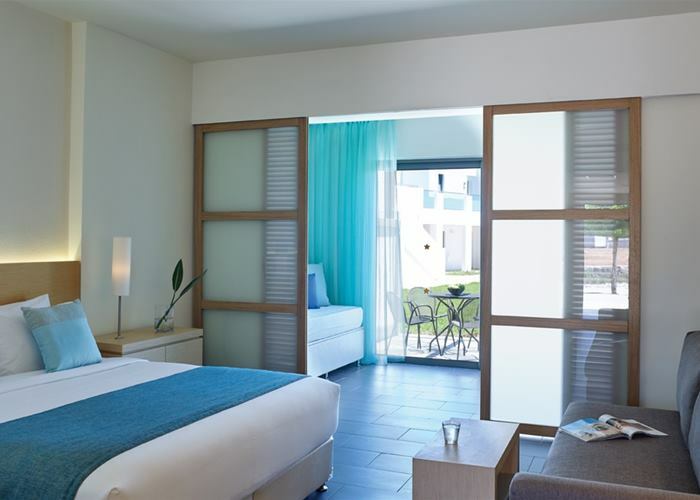 Rooms sleep up to 2 with a double bed and a terrace or balcony. There's a mini fridge stocked with refreshments on your arrival and replenished with water every two days and other essentials like LCD TV and air conditioning. 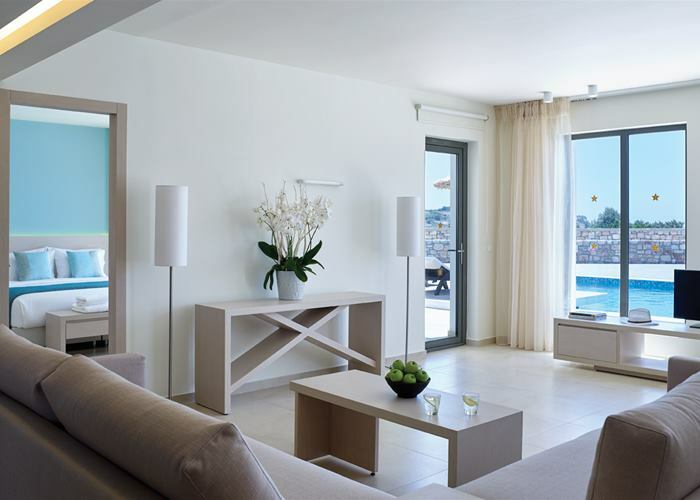 The pool comes right up to your balcony here with a spacious terrace complete with sun beds and a view to the sea. Rooms sleep up to 2 with a double or twin beds. There's a mini fridge stocked with refreshments on your arrival and replenished with water every two days and other essentials like LCD TV and air conditioning. 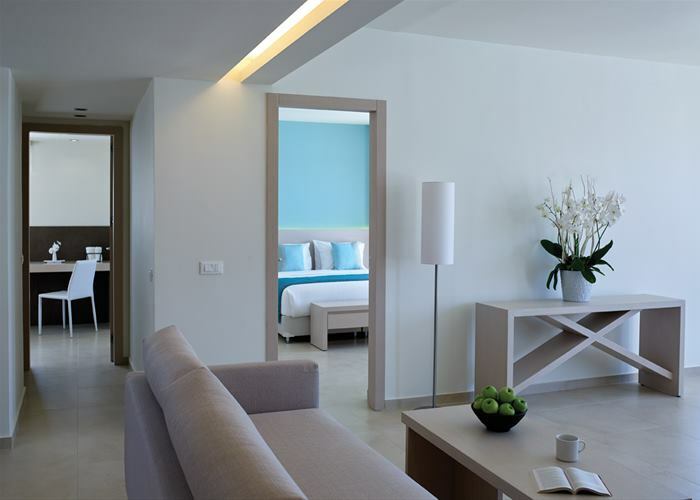 The feeling is fresh with white washed walls and a cooling hint of sky blue. 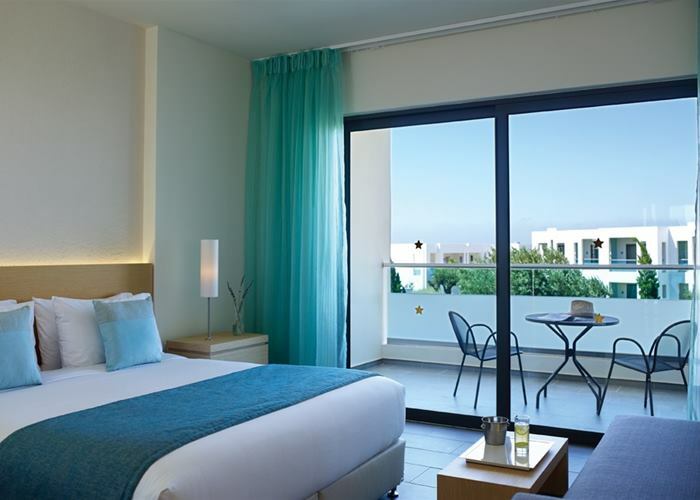 Rooms sleep up to 3 with a double or twin beds, sofa bed and a terrace or balcony. 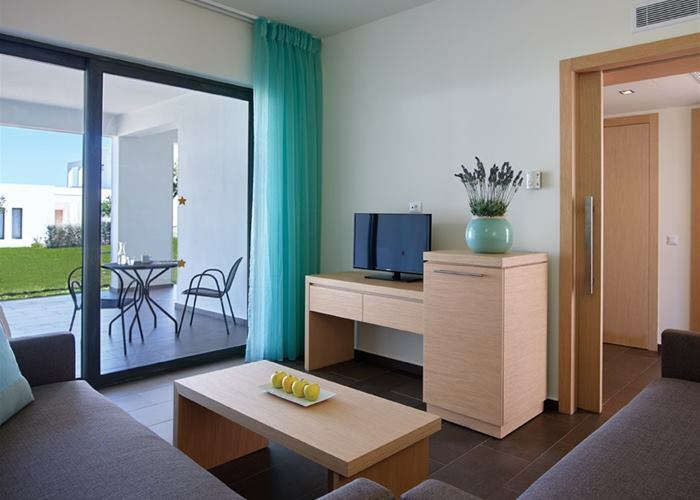 There's a mini fridge stocked with refreshments on your arrival and replenished with water every two days and other essentials like LCD TV and air conditioning. If an early morning dip or a relaxing evening swim from the comfort of your own terrace or balcony is high on your holiday list of "things to do" then this room with sharing pool is ideal. 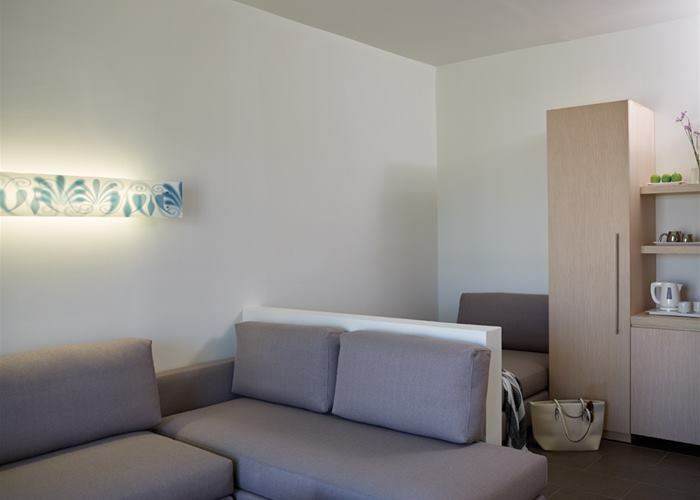 The suite, sleeping up to 4 has a double bed in the bedroom and two large sofa beds in the living room. There's a terrace complete with sun loungers and all the essentials like a mini fridge stocked with refreshments on your arrival and replenished with water every two days, LCD TV and air conditioning. There's enough space in these rooms for the whole family and plenty of privacy as the two sleeping areas are separated by a sliding partition. Family rooms sleep up to 4 with a double bed and then 2 single beds on the opposite side of the partition. There's also a balcony or terrace and all the essentials like a mini fridge stocked with refreshments on your arrival and replenished with water every two days, LCD TV and air conditioning. There's enough space in these rooms for the whole family and plenty of privacy with the main bedroom and seperate lounge area.One bedroom suites sleep up to 4 with a double bed and then sofa beds in the lounge There's also a balcony or terrace and all the essentials like a mini fridge, LCD TV and air conditioning. 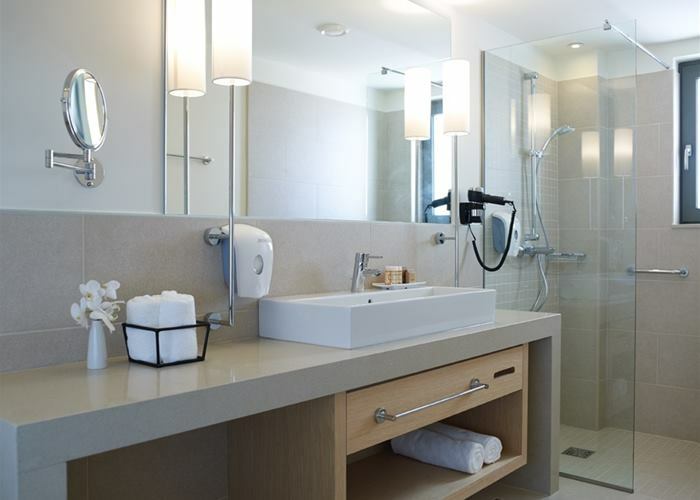 These suites have a modern design and are perfect for families. The suite, sleeping up to 5 has a double bed in the bedroom, two sofa beds and a childs bed in the spacious living room. 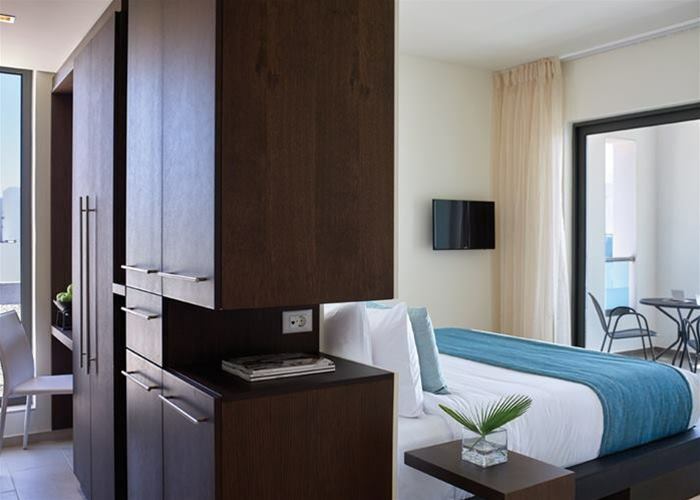 There's a terrace or balcony and all the essentials like a mini fridge stocked with refreshments on your arrival and replenished with water every two days, LCD TV and air conditioning. A perfect choice for the larger family with two bedrooms and a spacious living room that easily doubles up in to a sleeping area. 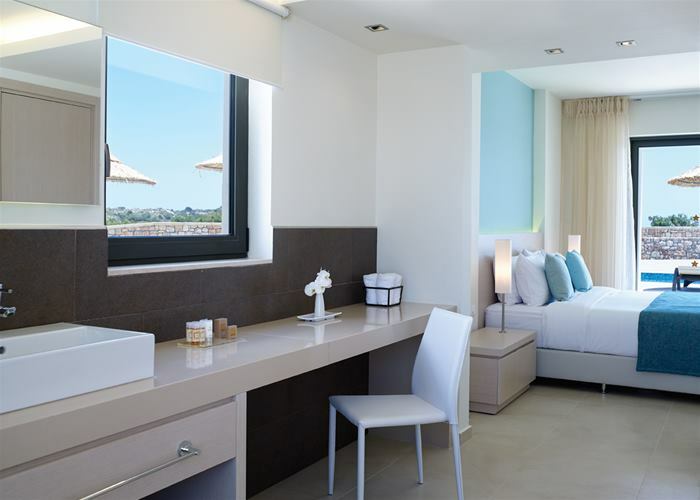 These suites have a terrace and bedrooms with double or twin beds. The living room has two sofa beds and all the essentials like a mini fridge stocked with refreshments on your arrival and replenished with water every two days, LCD TV and air conditioning.